We have been leafing through Yves Marek's splendid survey of chess-art Art échecs et mat (2008), taking his themes one by one. In the first post, Themes Like Only Yesterday, we looked at Orient, Rois de jeux/jeu des rois, Renaissance, and Divertissement. Then, in Themes Like Today Already, we picked over Érotisme, Abîmes, and Mat. 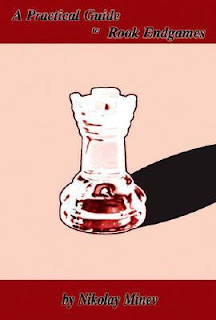 This week we continue in contemporary vein with Géométries, and then after a brief dip into Le moment Duchamp, and L'art est jeu, we go on to suggest a couple of modern-day chess-art themes of our own. So what's Ray been up to this week? I believe he's been in Mexico, but while he's been away, his columns in the Times have been treating us to Petrosian. 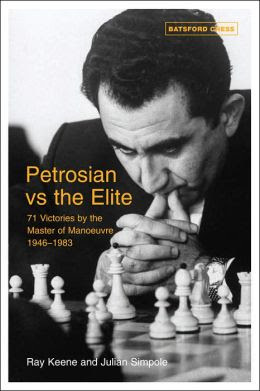 Here's his column from Saturday, August 24 2013, offering us Petrosian-Botvinnik, the nineteenth game from their 1963 match. As ever with any old game that Ray chooses to annotate, the challenge for the reader is to find out where the notes have been cribbed from and in this instance we can locate them in a 2006 Batsford book written by Raymond Keene and Julian Simpole and entitled Petrosian vs the Elite. The column game is number 23 in the book, appearing on pages 83-88. Like many of Ray Keene's columns, this piece has been written well in advance (albeit it's not been copied off anywhere or anybody else). Today I should be flying back home from my holidays, which in my case meant coming back to the UK and among other things playing in a tournament in London. So let's have a glance at a game from another London tournament, one played in 1922. 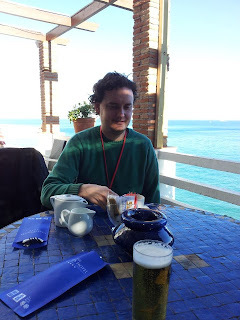 Specifically, the game Capablanca-Bogoljubow and the notes provided to that game in Ray's Spectator column in the issue for 15/22 December 2012. You'll not be amazed to learn that Ray's notes were plagiarised wholesale from the first part of My Great Predecessors, where the game appears on pages 296 to 299. 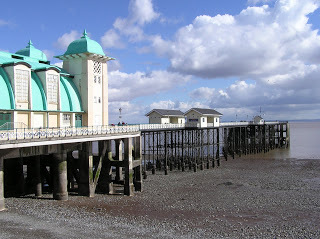 OK, after the interlude it's back to some unfinished business from Penarth. I wasn't the only one getting amongst the rooks and pawns in Wales. 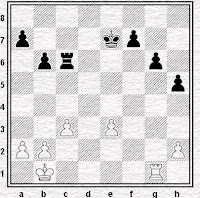 Jack Rudd also had a rather interesting one and he kindly sent me the moves so we can look at it here. Always worth reminding ourselves that not all rook endings are drawn. Not even the ones with level material. Since I've no idea what either of the players were actually thinking during the game, I'm going to indulge in a spot of idle ill-informed speculation. Jack's decision here doesn't seem to be too difficult. 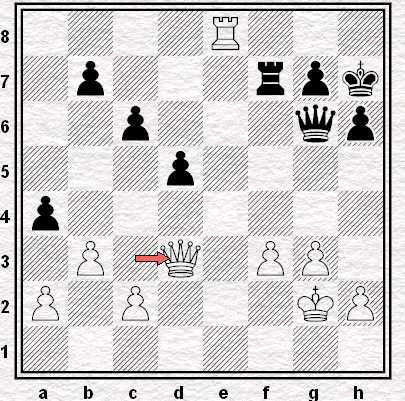 The queens are coming off anyway, so you might as well inflict a little damage on White's pawn structure before they go. White's thought process requires a bit more guess work. His last move was 33 Re8+ Kh7 so I assume he was planning the trade. 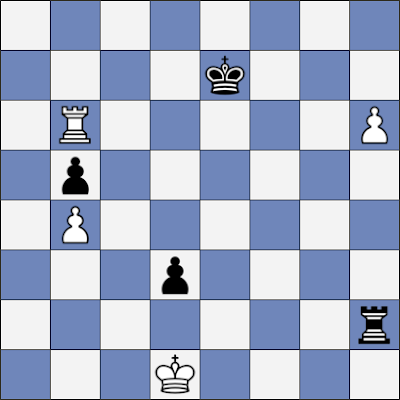 It also seems likely that he'd have expected the position that arose after 34 ... Qxd3, 35 cxd3 axb3, 36 axb3. What was he thinking, do you imagine? Was Tartakover's famous aphorism coming to mind? Something along the lines of "This should be drawn", "This doesn't look so bad" or "I can hold this", perhaps? When I was looking at this position, trying to assess it for myself, I was reminded of a passage from Mihail Marin's marvellous chapter on Rubinstein in Learn from the Legends. After a thorough study of Rubinstein's games, I have developed a rough method for preliminary evaluation of rook endings. 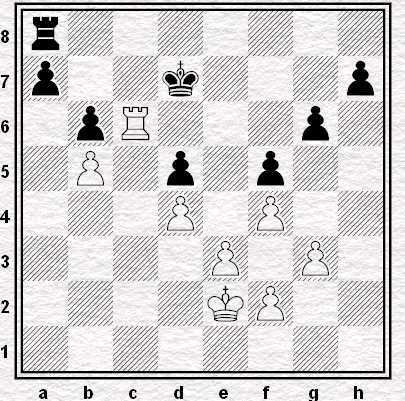 For each favourable element such as an extra pawn, spatial advantage, the more active rook or an important weakness in the enemy camp, one point is awarded. If the difference between the two sides is one point (scores such as 1-0, or 2-1) the position is clearly better but not necessarily winning ... With the exception of some extreme cases (for instance, the ending with f- and h-pawns) a score of 2-0 or 3-1 should guarantee a win. All every well, but it kind of depends on how you define "important" doesn't it? So White has weak pawns on b3 and d3. Are they important? If they are do they count as one point or two? What about the second rank which looks a little vulnerable with the pawn already on f3. Is that significant? 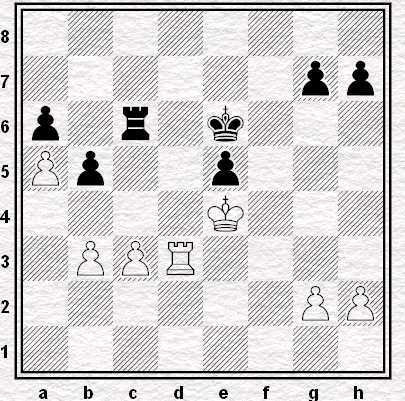 And what of Jack's queenside majority and the potential for creating a passed pawn on that side of the board? 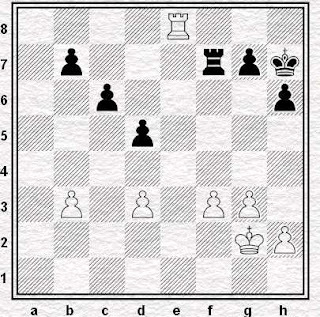 The other side of the coin: White's rook looks much better than Black's at the moment. On e8 it stops Jack getting at White's weaknesses because he can't get his rook to either open file. As we'll see, though, Black can actually evict the enemy rook rather easily. So White's liquidated one of his loose pawns, but at the cost of allowing Black's rook into the game. d4 looks considerably more "important" than c6 right now and everything else is pretty much the same save for the fact that Black's improved his king. 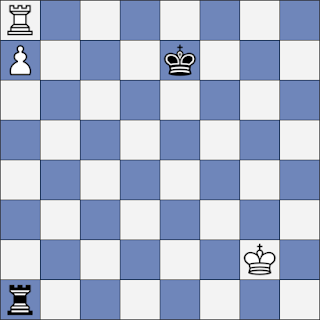 I wouldn't want to give a definitive judgement, but to me this looks rather tricky for White now. I wonder if the position at the beginning of the rook ending was simply much more difficult than White imagined when he decided to head for it. I've been looking at a few of Rubinstein's games recently and off the top of my head I can think of four that The Man won despite the rook ending starting with an equal pawn count. 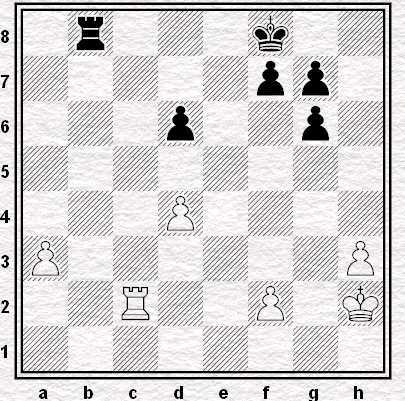 In every one of those four his opponent, like Jack's, had pawn weaknesses to defend. Whatever the objective assessment might be for this kind of position - the consensus of opinion seems to be that both Alekhine and Spielmann had chances to split the point - it seems that holding such positions is often just too big an ask in practice. So thanks to Jack for sending me the game. What to take from it? Other than the truism that if you're facing somebody who has 300+ elo points more than you do you're probably going to lose in the end whatever you do, I mean. Maybe, to adapt a phrase of John Nunn's, there's something about loose pawns in rook endings and their tendency to make your game drop off? 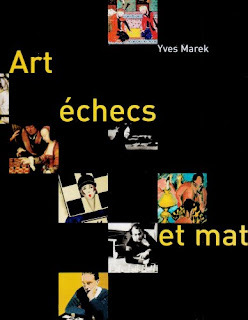 This post continues the examination of Yves Marek's book Art échecs et mat (2008) begun last week. We have now got to those themes with a more contemporary genesis and resonance. 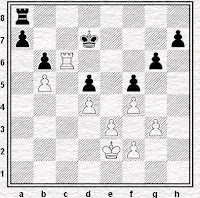 As last time, as we go along we will cross-reference some of ejh's Chess in Art sequence of 2008, while adding a few (quite a few) observations of our own. But first let's meet the man himself on YouTube, in an interview with the French online chess magazine Chess and Strategy in 2009. At the end of Wednesday's post there was a mention of Hardinge Simpole, the publishing house which Ray was promoting in the column we were examining. So who are Hardinge Simpole? As they tell us themselves, they're an imprint of a publishing company called Zeticula Ltd, a registered company with offices in Knightsbridge and an address in Ayrshire. It unsurprises us further to learn that Ray was a director of this company for a period of ten and a half years. According to the site Ray ceased to be a director early in 2012. This means he was still a director when the Spectator published his column in its issue for 8 October 2011. This column was employed to promote a book called Football And Chess. This book was published by Hardinge Simpole, a company of which Ray was at that time a director. Not that he took the trouble to inform us of his interest in a product he was persuading us to buy. Let's have a look at Ray's Times column for 13 August 2011, which covered the first game of Smyslov's 1958 world championship rematch with Botvinnik. 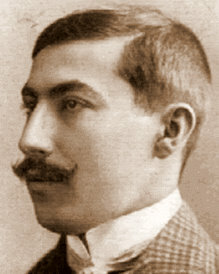 Ray returned to the same Smyslov-Botvinnik game this year, annotating it in his column of 29 May 2013. The two columns are mostly quite different - they even annotate entirely different moves in the game, with the odd exception of Black's thirty-first. These annotations are evidently identical other than possessing different typographical errors, but other than that, save that they are annotating the same game, the columns appear to be different in every respect. 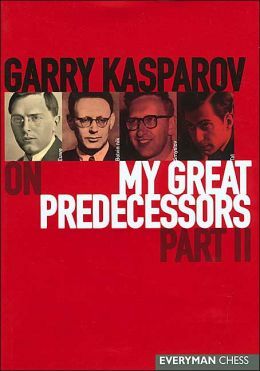 They are, however, identical in one important respect, which is that they are both plagiarised from Part II of Garry Kasparov's My Great Predecessors. 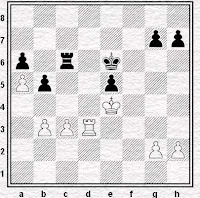 Here’s the plan: now the British is over - RRE: The Brits; Howell Wins - finish up with Penarth, finally polish off those posts that have been kicking around waiting to be written for a while now and then go back to Torquay for a closer look at some of the 60-rook endings that happened there. Well, that was the plan. I’m afraid I got distracted at the weekend when I noticed that Malc’s Chess Emporium had Minev’s A Practical Guide to Rook Endgames on sale for a fiver. 'That'll do me', I thought, as I made my way to Baker Street. It was only intended to be an inexpensive addition to be collection. 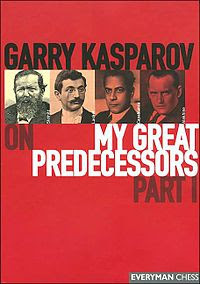 What I discovered was that, aside from being cheap, A Practical Guide ... is really a rather interesting read. For a start it works backwards compared to most books. Minev doesn’t begin with rook and pawn vs rook and move on to rook and two vs rook, slowly adding pawns thereafter as is traditional. He saves all that stuff for the second half, kicking off with sections on common tactical and strategic themes instead. ... with Minev quickly showing how much more complicated positions can boil down to the same fundamental principle. The position at the head of today’s blog - Vasiukov - Dzindzichashvili, USSR ch 1972 - for example. OK, there are a lot of books to choose from when it comes to rook endings. Minev’s is far from new - flicking through it I couldn’t find any games played after 1979 - and feels a bit slim, somehow. And yet it seems like a really decent book. Well worth £5, I’d say. Certainly not something that's only of interest to cheapskate collectors. I stumbled on the magnificent Art échecs et mat by Yves Marek a few years back in a Paris bookshop, and mentioned it on the blog at the time. It must be the only book of its kind - solely about chess in art - and it's worth a closer look; which is what this post, and a couple subsequently, are going to do. 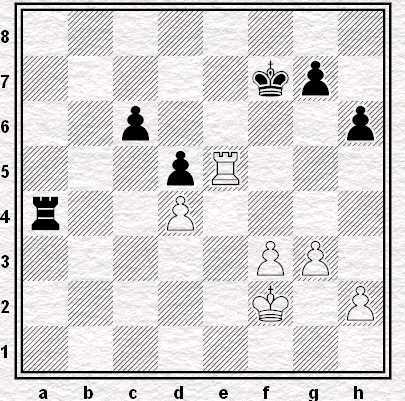 In the Olympiad of 2010 Michael Adams beat Magnus Carlsen on the top board in the England v Norway match. Ray Keene covered the game in his Times column on 29 September 2010. He then annotated it again in his Spectator column, entitled "Adamantine", in the issue dated 9 October 2010. It's not too hard to spot similarities between the two pieces, but let not that question detain us too long, because it is rather easier to detect similarities between the Spectator piece in particular and the Times column he wrote, annotating the same game, for his column on 12 April 2011. And the Times column he wrote, annotating the same game, for his column on 30 July 2011. And the Times column he wrote, annotating the same game, for his column on 2 December 2011. And the Times column he wrote, annotating the same game, for his column on 13 March 2012. Above is page 58 of the Spectator for 1 September 2012 in which Ray Keene's chess colummn appears, annotating the game Petrosian-Gligoric, Rovinj/Zagreb 1970 as well as commenting on the arrest of Garry Kasparov, "accused, doubtless falsely". 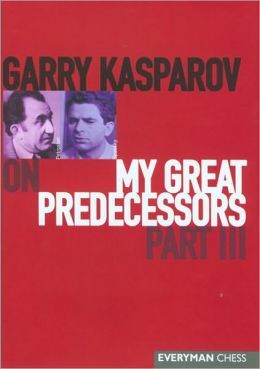 Below is the cover of Part III of My Great Predecessors (Everyman, 2004) in which the game Petrosian-Gligoric is annotated on pages 44-48, annotations which Ray Keene can be accused, doubtless correctly, of plagiarising. 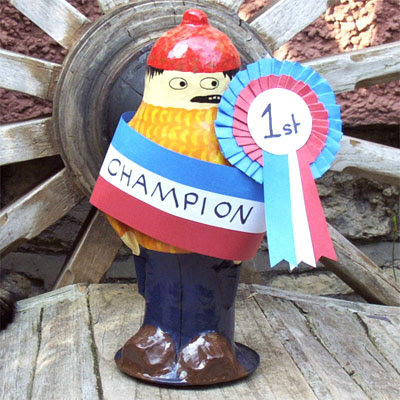 The only surprise was that securing the half-point no points he needed took about two and a half four hours instead of the thirty minutes max that I'd expected, but David Howell wakes up this morning as the new British Champion. Howell finished up on 9 9.5/11, only half a point and a half clear of his nearest challengers although his victory seemed much more comprehensive than that. For the record Mark Hebden and Gawain Jones and Simon Williams Stephen Gordon finished second equal on 8.5 8/11. ... so let's just say that while his opposition might have seemed familiar to him, his pairings were as tough as they could be. So congratulations Davey boy. Enjoy the £5,000. But, how about a rook ending or two next time? Some of us have got blogs to fill, you know?